Jeff Jones (1944-2011) was one of the most important illustrators of sword and sorcery fiction. He started out with Canaveral Press’ I am a Barbarian by Edgar Rice Burroughs in 1967. Donald Wollheim (again) jumped on the new talent for paperback covers. Jones provided art for two of Jack Vance’s “Planet of Adventure” series and for Fritz Leiber’s Fafhrd and the Gray Mouser collections. Also in 1968, Jones produced the art for Donald M. Grant edition of Red Shadows, a collection Robert E. Howard’s “Solomon Kane” stories. The cover image was reused for the Centaur Press paperback in 1971. During the late 1960s and early 1970s, Jeff Jones was a sort of poor man’s Frank Frazetta. You would see his art for lower level paperback publishing houses such as Pyramid Books, Belmont Books, and Paperback Library. These covers show the heavy influence of Frank Frazetta. Jones also did some work for Warren Magazines. He did a few covers and a handful of interior black and white stories for Creepy, Eerie, and Vampirella. He was a steady producer of paperback book cover art through the first half of the 1970s. He also did some covers for the Ted White era Fantastic Stories. Walter Zacharius had been at Lancer Books which has imploded in 1973. Zacharius and Roberta Grossman founded Zebra Books in 1974. Zacharius made a deal with Glenn Lord, agent for the Robert E. Howard copyright holders to reprint a fair amount of REH in paperback. Jeff Jones the artist for most of those. 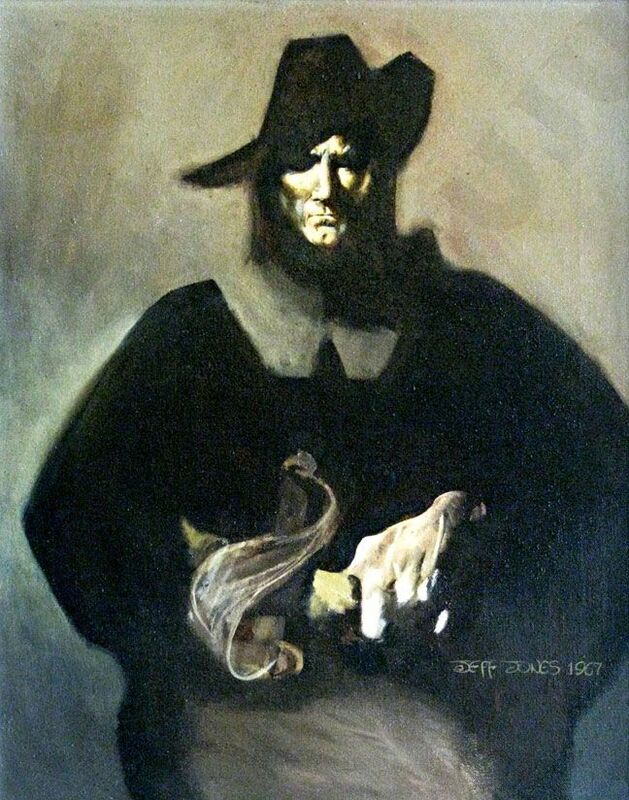 What is interesting is his style had changed from faux-Frazetta to something more on the lines of N. C. Wyeth. To me, this is the classic era of Jeff Jones painting. The paintings are something different from Frank Frazetta, yet they capture sword and sorcery in a different form. Worms of the Earth, The Book Of Robert E. Howard, The Second Book of Robert E. Howard, and Tigers of the Sea are favorites. The cover for The Vultures of Whapeton is a great cover but has nothing to do with the contents. Ditto for The Adventures of Dennis Dorgan. Jones painted covers for Robert E. Howard pastiches including Karl Edward Wagner’s Legion From the Shadows and Andrew Offutt’s The Sword of the Gael and The Undying Wizard. After this flurry of activity, he began appearing less and less after 1976. He disappeared as a paperback cover artist after 1979. He was back to do the cover the Donald M. Grant The Book of Kane in 1985. He did another book of post cards for Donald M. Grant in 1994. There was also a trading card set the same year and an art book, The Age of Innocence. Jones returned to do a lavishly decorated limited hardback of George R. R. Martin’s A Game of Thrones in 2002. There was a Jones art book in 2011, Jeffrey Jones: A Life in Art. Unfortunately, Jeff Jones died in 2011. Those covers he did for Lancer Books were a boon for Howard fans. I still love looking at the cover for The Second Book of Robert E. Howard. I’m really digging the anatomical detail on the upper body. Jones in my opinion, is probably the best S&S artist out there. I love that art – the “Second book of Robert E Howard” cover is one of those things that has stuck in my mind a long time. Looking back on it now I wonder if it’s supposed to be Karl Wagner’s “Kane” character…? The quality is near Frazetta level and reminds me of “Dark Kingdom” a lot. I mean, yeah, Generic Viking probably but Wagner worked with some works by that publisher, I think on some Conan pastiche work, Bran Mak Morn stuff. That “Viking” is blonde. Kane is unequivocally a redhead. Did Wagner ever decribe Kane as wearing a winged helmet? I don’t recall such an instance. Jones just let his imagination run wild for those Zebra covers, not seeming to care a lot about how exactly they fit the contents. Beautiful paintings. As Morgan noted, Jones DID illustrate Kane once a decade later in THE BOOK OF KANE. If you want a “shoulda been Kane” painting from Jones, check out his cover to Page’s SONS OF THE BEAR GOD. He’s the definitive Solomon Kane artist. Great post as always. I have been a big fan of this artist for a while. Thanks for the info. Sorry to hear this is the last post for this series. I hope it comes back soon. I look forward to this post each week. Thanks! Frazetta brought the power to REH art. Jones brought the poetry. Jones illustrated several actual Howard poems in those two “Book” volumes. Jones was my favorite illustrator, and I credit him for starting me on the path of being a professional painter/illustrator. I interviewed him, in the 80’s, for a paper I wrote, in a college painting class. He was a complete gentleman, and scholar!